Javier Solana received the "Knight of Freedom" award for his commitment to a peaceful solution of the political conflict related to the presidential elections in Ukraine in 2004. Accepting the award Solana stressed the "very special relationship" between him andPoland. He is a graduate of the University Complutense of Madrid, where he worked as a professor of physics. He has published more than 30 scientific papers in this field. In the sixties he joined the socialist youth, while from 1974 he was a member of the Spanish Socialist Workers Party (PSOE). In 1982 after coming to power socialists, he served as minister of culture, as well as government spokesman in 1985-1988. In the years 1988-1992 held the position of Minister of Education and Science. 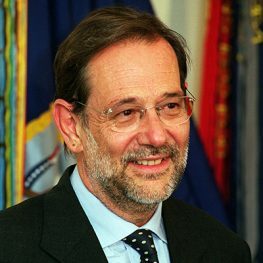 From 1992 to 1995 he held the post of Minister of Foreign Affairs of Spain. In the period from 1995 to 1999 Solana served as Secretary General of NATO. In the years 1999-2009 he was the High Representative for the Common Foreign and Security Policy and Secretary General of the Council of the European Union.